This recipe for Chicken Stuffed Biscuits, filled with shredded chicken, gravy, olives, and eggs is perfect to serve for breakfast or brunch or on the go. For centuries, a biscuit referred to a dry, hard, twice-baked cake that was a staple for sailors and soldiers. It wasn’t until the 19th century that the fluffy, light biscuits that we know today originated. Increased wheat production made flour more affordable and the development of chemical leaveners, like baking soda and baking powder, provided a much-needed lift to the biscuits. The practice of stuffing things with mixtures of grains, meats, spices and other chopped ingredients is ancient. 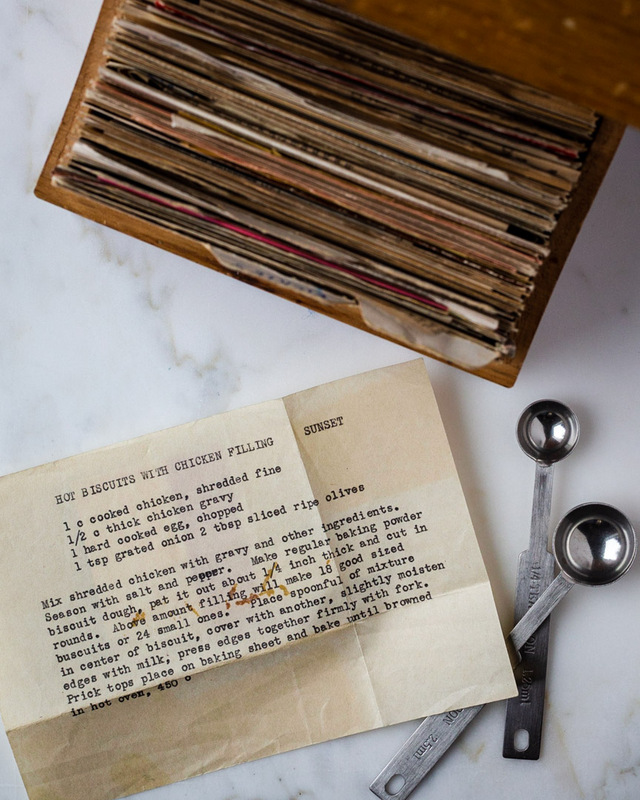 The first documented recipes using stuffing comes from a Roman cookbook published between the 2nd century BC and the 1st Century AD called Apicius de re Coquinaria. It even has a recipe for stuffed dormouse. Yummy! Perhaps the notion to stuff things came from a desire to fill the emptiness, like the cavity of pepper or a chicken, with something. Maybe it provided a sense of abundance. Stuffing something as delectable as a flakey, fluffy baking powder biscuit with chicken and gravy definitely feels abundant to me. 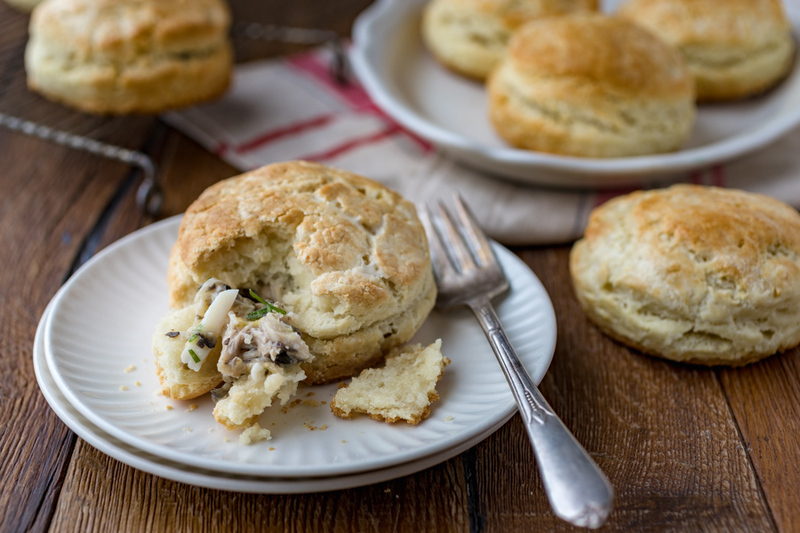 These Chicken Stuffed Biscuits are great to serve at breakfast or for a Mother’s Day or Easter Brunch. They even make a great grab-and-go lunch. 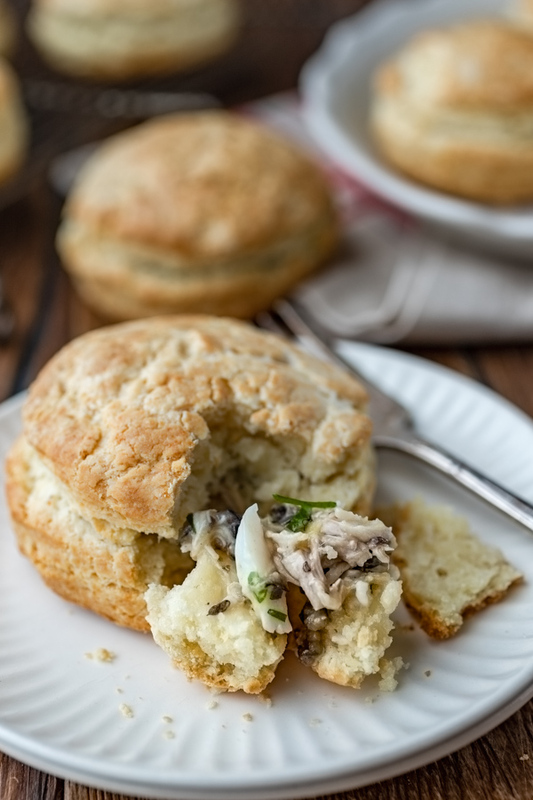 This recipe for Chicken Stuffed Biscuits, filled with shredded chicken, gravy, olives and eggs is perfect to serve for breakfast or brunch or on the go. Roll dough to 1/4-inch thick and cut into rounds. The filling will make 18 good sized (2 3/4-inch) biscuits or 24 small ones (2 1/8-inch). Press the edges together with your fingers or with the tines of a fork. Place on baking sheet and bake until golden brown and fluffy, about 15 minutes. What a cool idea! You could totally re-purpose Thanksgiving or Christmas leftovers with this recipe 🙂 They would pair well with a soup, I think. Absolutely! Good to have some options for those leftovers. I hadn’t ever heard of this recipe until I pulled the recipe from the recipe box. I was delighted with the results. I love this recipe! It has all my favourite things. I like making plain biscuits and this is a delicious upgrade. Always good to have an upgrade to those tried and true recipes. Take out the olives and I am all over this! I love biscuits, chicken is my go-to meat, and gravy makes everything better. We are definitely making this at home soon. And that’s the beauty of cooking at home, you make the recipe your own 😉 Hope they are a hit! This biscuit looks so yummy. Maybe I can try to make this for Easter. This would make a great Easter dish. You could even make them the night before. Yummmy! This looks delicious. 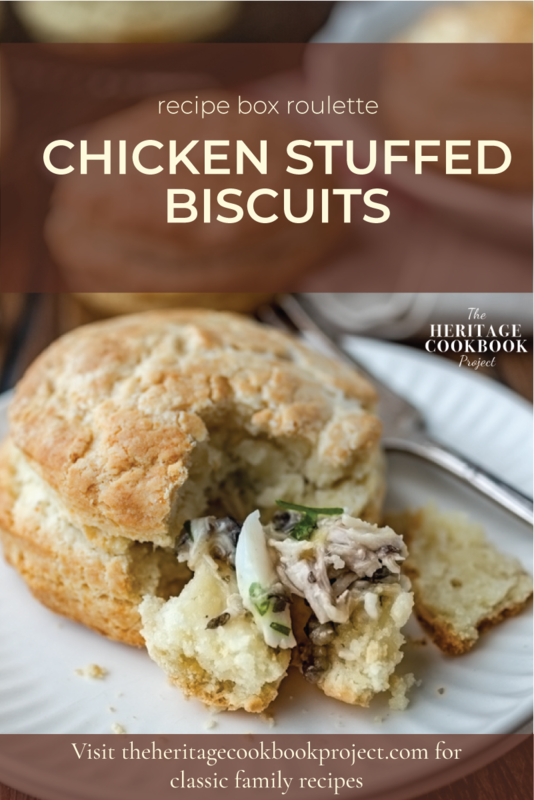 I have never tried chicken stuffed biscuits but would love to try out this recipe. This recipe is pretty darn good. Hope you give them a try. Omg now this is what I call #foodporn!!! I’m always looking for new chicken recipes. Definitely need to give this a try. Thanks for the kind words, Courtney. It’s a fun chicken recipe for sure. They are tasty. Hope you do give them a try and enjoy them. This sounds delicious and definitely not something I’ve ever tried to make before. I loved stuffed foods and biscuits is a favorite. I think that you may fall in love with these if you love stuffed foods. Well this looks so good! I think its something both my husband and son would love! Hey Neely. Thanks for stopping by. Let me know how you husband and son like them. Ummmm, I’m on a diet and this is killing me. I want all the carbs! All of them!! Looks delish. Sorry to cause so much temptation 😉 The recipe will be here when you are ready to give it a try. Cheers! Mmm, these look so delicious! 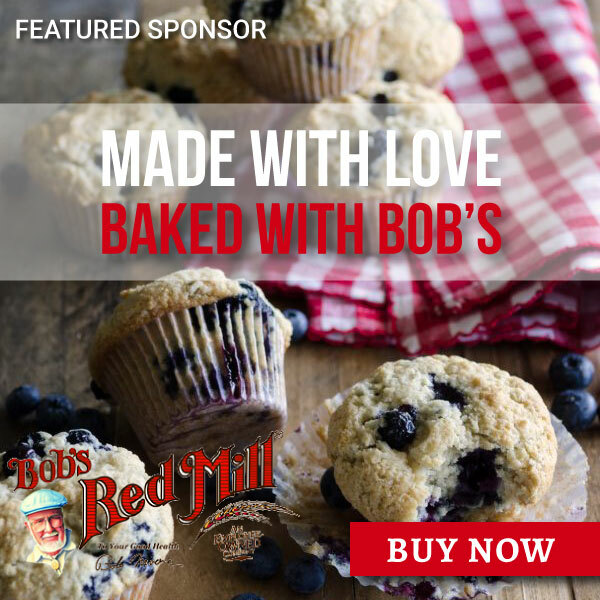 Such a classic treat, and I bet they are super-tasty – my fam would LOVE them! Thank you. This was a fun recipe to make. I hope you give it a try and enjoy them. I agree. These would make a great dinner party treat. Who can resist a tasty little surprise inside a flaky biscuit. This looks delicious! I’ve never tried something like this in my house. I am going to have to add this to my recipe book and make it for dinner soon! Let me know how it turns out, Jessie. Can’t beat a good biscuit.